Foster the People is an American indie pop band formed in Los Angeles, California in 2009. It currently consists of lead vocalist Mark Foster and drummer Mark Pontius. Their music, described as melodic dance-infused pop and rock, spans many genres. Foster founded the band in 2009 after spending several years in Los Angeles as a struggling musician and working as a commercial jingle writer. After Foster's song "Pumped Up Kicks" became a viral success in 2010, the group received a record deal from Startime International and gained a fanbase through small club shows and appearances at music festivals. After releasing their debut album Torches in May 2011, "Pumped Up Kicks" became a crossover hit on commercial radio in mid-2011 and eventually reached number three on the Billboard Hot 100. The record also produced the popular singles "Helena Beat" and "Don't Stop (Color on the Walls)". The group received two Grammy Award nominations for Torches and "Pumped Up Kicks". After touring for two years in support of Torches, Foster the People released their second album, Supermodel, in March 2014. It was preceded by the lead single "Coming of Age". Mark Foster founded the group in Los Angeles in 2009 after years as a struggling musician. Mark Foster graduated from Nordonia High School in the suburbs of Cleveland, Ohio. At his father's encouragement, Foster moved in with his uncle in Sylmar, Los Angeles, California to pursue a career in music. Foster worked various jobs and at night, he attended parties in Hollywood to expand his social network. He said, "I felt like an 18-year-old Hunter S. Thompson. I was just diving into this Hollywood Hills subculture and taking it all in. I wasn't shy about taking my guitar out at a party. I wanted to be the center of attention." At one time, he roomed with actor Brad Renfro. Foster struggled with drug addiction during his initial years in Los Angeles, saying, "It got pretty dark. My friends thought I was going to die. I was blind to it. When I was 19 years old, it got to a point where I said, 'Enough is enough' ... I saw time was just passing me by. I wasn't being productive." Several attempts at founding a band proved unsuccessful. After turning 22, he says he was contacted by Aftermath Entertainment about showcasing his musical talents, but the opportunity ultimately fell through. For the next few years, Foster waited tables at a cafe while dealing with writer's block, but he remained in Los Angeles after landing a job as a commercial jingle writer for Mophonics in 2008. He said of the profession, "I definitely learned from the commercial standpoint what works," and he credited it with reviving his confidence in performing. The music Foster wrote spanned a wide range of genres, but he had difficulty reconciling his eclectic compositions. He explained: "I'd write one song and it'd be a hip-hop song. I'd write another and it'd be heavily electronic. Another would be like a spiritual, and another would be classic piano song. I was constantly trying to pull those elements together. It took me six years to do it." He still wished to be part of a group; reflecting on a residency he did at a venue performing electronic music, he said, "It was just me and a laptop. Really, it was terrible. I knew I needed a band." Foster the People was born out of a nascent relationship with drummer Mark Pontius, a film school student who left his group Malbec in 2009 to found a band with Foster. Pontius was impressed by the number and diversity of songs that Foster had written to that point, saying, "Some were on the guitar, and some were on the computer. But it was this really awesome singer-songwriter thing with a tricked-out beat, and I felt we could go wherever we wanted with this." The group added a bassist, Foster's long-time friend Cubbie Fink, who lost his job at a television production company during the recession. Mark Foster originally named the band Foster & the People, but people misheard it as "Foster the People". Eventually, he took to the nurturing image it evoked of "taking care" of people, so the name stuck. Not long after the group formed, Foster wrote and recorded a song at Mophonics called "Pumped Up Kicks", which eventually proved to be the band's breakthrough. After Foster posted the song on his website as a free download in early 2010, it drew considerable attention; Nylon magazine used the track in an online advertising campaign, and through various blogs, it went viral. The group, yet to be signed, garnered buzz with performances at the South by Southwest music festival in March 2010. Foster was emailed by many people about "Pumped Up Kicks", and needing professional guidance, he contacted artist manager Brent Kredel at Monotone, Inc. in March, saying, "Everyone is calling me and emailing me—what do I do? Who are the good guys, who are the bad guys?" Kredel recalled that "He went from the guy who couldn't get a hold of anyone to being the guy who had hundreds of emails in his inbox." Kredel and Brett Williams were subsequently hired to co-manage Foster the People, and they arranged meetings for the band with several record labels, including Warner Bros., Atlantic, Columbia, and Universal Republic. In May 2010, the band was signed to the Columbia imprint Startime International in a multi-album deal. The deal did not involve ancillary rights. Foster controls publishing of the songs in North America, while a separate 2010 deal with Sony/ATV Music Publishing controls publishing outside of North America. After Foster the People signed their record deal, Kredel said, "The focus was to stop everything and not work on any marketing or touring, but to make an album that backed up 'Pumped Up Kicks.'" Wishing to avoid burnout, Startime allowed the group to pace themselves and not rush an album that would cash in on the popularity of the song. Isaac Green of Startime said, "You can't control everything, but you can be meticulous about the music." 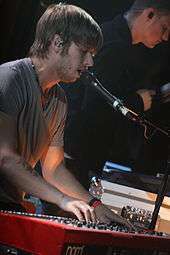 From July to September 2010, the group wrote new material that would appear on their debut album, and they chose Paul Epworth, Rich Costey, and Greg Kurstin to co-produce the record with Mark Foster. In September, "Pumped Up Kicks" was released as the group's debut single. Without much experience as a live act, Foster the People were booked in October 2010 to play several club shows "to help them get their sea legs". Booking the group proved difficult, as concert promoters were hesitant about an artist without previous touring experiences. Foster the People promoted these concerts by emailing fans who had downloaded "Pumped Up Kicks" from their website about the shows. In early 2011, the band was booked to perform in a much sought-after tent at April's Coachella Valley Music and Arts Festival. Meanwhile, the group continued to grow its fanbase with a month-long residency of concerts in January at The Echo nightclub in Los Angeles. According to booking agent Tom Windish, by the group's third show at the venue, "there were hundreds of people trying to get in outside.... It was an obvious turning point that could be measured in numbers." The residency also drew the attention of music supervisors in attendance who would later help the group license their music. Foster the People issued its first commercial non-single release in January 2011, a self-titled EP featuring "Pumped Up Kicks", "Houdini", and "Helena Beat" that was intended to hold fans over until their first studio album, Torches, was completed. Fans who purchased the EP through the iTunes Store were able to apply it towards the purchase of their full-length debut album. The EP drew the attention of organizers of March's South by Southwest festival, as well as executives looking to license music for upcoming season finales of television series. Columbia senior director of creative licensing Jonathan Palmer said, "The plan helped us a great deal to set up more opportunities rather than chasing the release date. So by the time we put the record out in May, we had already placed several songs." Half of Torches' songs were licensed—among them are: "Pumped Up Kicks" (Gossip Girl, The Vampire Diaries, Friends with Benefits, Entourage), "Houdini" (Gossip Girl); "Helena Beat" (The Vampire Diaries); "Don't Stop (Color on the Walls)" (Suits, Nissan Motors commercial); and "Call It What You Want" (FIFA 12). Palmer commented, "I haven't seen this kind of a range of song licenses from one album since we worked the first Ting Tings record three-and-a-half years ago. That was an album where we licensed nine or [all] 10 songs on the album. We're kind of in a similar situation [with Torches]." Beginning in July 2010, Sirius XM satellite radio's Alt Nation channel began playing Pumped Up Kicks, followed by many alternative radio stations including Los Angeles terrestrial stations KROQ-FM and KYSR in January 2011. Mark Foster credits Sirius XM's airplay with the song's success, saying, "Alt Nation played our music before any other radio outlet in the country." On January 29, the song debuted on Billboard's Rock Songs chart and a week later, it debuted on the Alternative Songs chart. In May, the track debuted at number 96 on the Billboard Hot 100, and later that month, the group released their first full-length studio album, Torches. The success of "Pumped Up Kicks" and appearances on many late-night talk shows, including Last Call with Carson Daly, The Tonight Show, Jimmy Kimmel Live!, and The Late Late Show with Craig Ferguson, helped the record debut at number eight on the Billboard 200. To promote the album, the group undertook a concert tour in the US and Europe for much of the second half of 2011, with most dates sold-out. By the time the group took a break in December, they had toured for 10 consecutive months. "Pumped Up Kicks" proved to be a crossover hit, charting across several different radio formats; in addition to peaking at number one on the Alternative Songs chart in June and number three on the Rock Songs chart in July, the song broke into the top 40 of the Hot 100 in late July and appeared on the Adult Top 40 and Mainstream Top 40 charts. Columbia senior VP of promotion Lee Leipsner said, "It was one of the only alternative bands I remember in a while that you could actually dance to. And the fact that the record has a groove and rhythmic feel to it—not heavy guitar-based at all—gave us a wide opportunity to cross the record." He credits the song's crossover success and push into the top 40 to a June presentation of new music by Tom Poleman of Clear Channel. According to Leipsner, "After we showed our presentation, we had so many Clear Channel major-market programmers come up to us and say, 'The record I want to play besides Adele is Foster the People.'" "Pumped Up Kicks" peaked at number three on the Hot 100, spending eight consecutive weeks at the position. According to Nielsen Soundscan, over 321,000 copies of Torches have been sold in the US. "Pumped Up Kicks" finished 2011 as the sixth-best-selling digital song of the year, with 3.84 million copies sold. The band was named in a lawsuit filed by Brandon Dorsky on May 24, 2011, alleging a breach of an oral contract between him and Foster, and that Dorsky had named the band. The case was settled for an undisclosed amount in July 2011. Foster the People appeared as the musical guest on the October 8, 2011, episode of Saturday Night Live, playing "Pumped Up Kicks" and "Houdini". Kenny G appeared as a guest performer on the latter song. At the end of the year, the group received two Grammy Award nominations: Best Pop Duo/Group Performance for "Pumped Up Kicks" and Best Alternative Music Album for Torches. At the awards ceremony, the band and Maroon 5 performed with The Beach Boys, one of Foster's childhood idols, in a medley of songs to celebrate The Beach Boys' 50th anniversary. Reflecting on Foster the People's sudden rise to success, Foster said, "For so many years, it was slow, playing in front of rooms full of 10 people and trying to get your friends to come... And then all of a sudden, it kind of took off. It's been a fast incline, so we've had to just work really hard, keep our heads down and just stay grounded. At the same time, we've had a lot of fun during the process." The group continued to tour throughout 2012. By the time the group's final US tour for Torches concluded in Los Angeles in July 2012, the group had played 295 shows in the previous 16 months. At the Brit Awards 2012, Mark Foster said that the group's second album would be released in 2013. In June 2013, the band played at the Firefly Music Festival, performing four new songs: "A Beginner's Guide To Destroying The Moon", "Pseudologia Fantastica", "Fire Escape", and "Coming of Age"—as well as at a secret show at The Troubadour in Los Angeles. Their second album was supposed to be released in November 2013, but Columbia decided to delay the release until January 2014 because they "didn't want them to be stumbling a hurtle too intense like that fourth-quarter competition. The record's so beautiful, we didn't want to take a gamble of potentially losing it in the rush." Foster told Rolling Stone, "This record still has the joy that our first album did, but it's been thrown into a pit and forced to dance among wolves." Foster said that the new album, which is "more organic and more human", would be released in early 2014. He hinted at a few new tracks, including "A Beginner's Guide to Destroying the Moon" and "Are You What You Wanna Be? ", and stated that the first single should be on radio by January. Foster also told Rolling Stone that, "In the first record, I was looking at my vision for the project through a piece of opaque glass," and that the next album will be "a clearer picture of what I've had in my head when it comes to that vision". Their second studio album, Supermodel, was released on digital retailers on March 18, 2014. The first single, "Coming of Age", was digitally released on January 14, 2014. They promoted the single by releasing a time-lapse music video of a seven-story mural of the Supermodel album cover being painted in downtown Los Angeles. Young and Sick, who also designed artwork for Torches, designed the mural. The painting took over ten days to complete. Although Young and Sick designed the mural, the actual painting was done by artists LeBA and Vyal under the guidance of Danial Lahoda, the owner and director of LALAarts. Foster explained that the mural wasn't intended to be a promotion for the album cover: "it's meant to be a piece of art for the city that happens to be an album cover." On January 23, 2014, the band played a free show in front of the mural. The album was followed by 3 more singles ("Best Friend", "Pseudologia Fantastica", "Are You What You Want to Be? "), and an extended play titled Spotify Sessions with recorded versions of five songs off their album. Following some legal controversy, the Supermodel mural was later painted over. On March 24, 2015, during an interview in Paraguay, Foster The People announced that they were working on a third album. When describing their upcoming record, they said that "the first record was more, kind of, electro-pop, the second record was more of a rock record, and I think this one is going to be a little more hip hop". On September 23, 2015, Foster the People announced that Cubbie Fink was leaving the band to pursue other opportunities. He stated, "I would like to express my extreme gratitude to our fans for your incredible love and support over the last four years. It was a true gift getting to perform for such loyal, passionate, and heartfelt people. I will miss playing and seeing all of you on the road. God bless you all." On October 9, 2016, Foster The People played at the Rocking The Daises Music Festival, performing three new songs from their unreleased album: "Lotus Eater", "Doing It For The Money", and "Pay the Man". Sean Cimino (front) with the group at the Bluebird Theater in June 2011. ↑ "Foster the People". AllMusic. Retrieved October 27, 2014. ↑ Lester, Paul (May 11, 2010). "Foster the People". The Guardian. London. Retrieved February 24, 2011. ↑ "Foster the People Attracts Hipsters, Moms with 'Pumped Up Kicks' Single". Billboard. 2011-05-19. Retrieved 2011-08-03. ↑ Soeder, John. "Will 'Pumped Up Kicks' yield Grammy gold for Foster the People?". The Plain Dealer. Retrieved 2014-01-16. 1 2 3 4 5 6 7 8 Martens, Todd (2011-06-26). "Foster the People: Pumped up, indeed". Los Angeles Times. Retrieved 2011-11-15. 1 2 Mansfield, Brian (2011-05-22). "On the Verge: Foster the People". USA Today. Retrieved 2011-11-15. 1 2 3 Doyle, Patrick (2011-06-08). "Band to Watch: Foster the People's Pumped-up Psych-Pop". Rolling Stone. Retrieved 2011-08-22. ↑ Fixmer, Andy (2012-02-23). "Taking Music in Ads Beyond Jingles". Bloomberg Businessweek. Bloomberg L.P. Retrieved 2012-02-27. 1 2 3 Reid, Poppy (2011-08-26). "Foster The People: Pumped Up Kids". The Music Network. Peer Group Media. Retrieved 2012-03-09. 1 2 3 4 5 6 7 Peters, Mitchell (October 3, 2011). "Foster the People: How a Free Download Begat a Business". Billboard. Retrieved November 15, 2011. ↑ "Foster The People: An Outsider Anthem, A Viral Hit". NPR Music. May 26, 2011. Retrieved August 14, 2011. ↑ Sanchez, Lindsay (2010-07-15). "Second Stage: Foster The People". NPR Music. Retrieved 2012-02-27. ↑ Menze, Jill (2011-06-09). "Foster the People pumped up for all ages". Chicago Sun-Times. Retrieved 2012-05-22. ↑ McKinley, Jr, James C. (January 15, 2013). "Star-Making Machinery's New Player". The New York Times. Retrieved April 20, 2015. ↑ "Grouplove to Perform Private Concert at The Studio at Webster Hall in New York City For SiriusXM Listeners" (Press release). PRNewswire. Sirius XM Radio. July 5, 2012. Retrieved February 11, 2016. ↑ Osborne, Spencer (2011-11-07). "FTP to host private concert for SiriusXM". Sirius Buzz. Retrieved 2011-11-15. ↑ Caulfield, Keith (2012-01-04). "Adele Rules 2011 With Top Selling Album & Song". Billboard.com. Retrieved 2012-01-05. ↑ "Saturday Night Live". Foster the People. Retrieved October 2, 2011. ↑ Potts, Kimberly. "Ben Stiller, Anna Faris Hosting 'Saturday Night Live'". Reuters. Retrieved October 2, 2011. 1 2 Quan, Denise (2012-01-10). "Foster the People on inspiration, odd jobs and meeting Bono". CNN. Retrieved 2012-01-11. ↑ Mitchell, John (2012-02-12). "Maroon 5, Foster The People Rock Grammy Stage With The Beach Boys". MTV. Retrieved 2012-02-14. ↑ Montgomery (2011-12-22). "Foster The People 'Experimenting' With Torches Follow-Up". MTV. Retrieved 2012-01-15. ↑ Bracelin, Jason (2012-07-06). "Foster the People set to pump up Cosmo". Las Vegas Review-Journal. Retrieved 2012-07-19. ↑ "Foster the People on Their 'Polarizing' Second Album | Music News". Rolling Stone. 2013-11-18. Retrieved 2014-03-17. ↑ "Foster The People frontman thrown out of Prince concert | News". Nme.Com. 2012-10-26. Retrieved 2014-03-17. ↑ "Supermodel by Foster the People". Itunes. 2014-01-14. Retrieved 2014-03-17. 1 2 Silver, Mamie. "Foster the People announce tour, free show". Alternative Press. Retrieved 27 January 2014. ↑ Edwards, Gavin. "Foster the People Unveil 'Supermodel' Mural in Los Angeles". Rolling Stone. Retrieved 27 January 2014. ↑ Vankin, Deborah (2011-06-26). "Leba-vyla-lahoda-painted-the-mural-for-supermodel". Los Angeles Times. Retrieved 2011-11-15. ↑ Wright, Lisa. "Off the Wall". NME - New Musical Express. Retrieved 2014-09-28. ↑ "Foster the People's Downtown L.A. Mural Is Coming Down". L.A. Weekly. Retrieved 2015-11-20. ↑ "Downtown Foster the People Mural Painted Over". NBC Southern California. Retrieved 2015-11-20. ↑ "Hablamos con Foster The People". YouTube. 2015-03-24. Retrieved 2016-06-22. ↑ "Foster The People". Facebook.com. Retrieved 2016-06-22. ↑ "Foster The People are back with a new single". Gigwise.com. 2015-12-09. Retrieved 2016-06-22. "Are You What You Want to Be?" "The Unforeseeable Fate of Mr. Jones"